Charley Boettcher’s pond was a fun swimming hole, but was originally mill pond. They got a permit to build it. It had a concrete spill way and an earth dam. 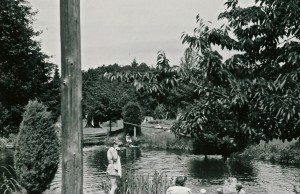 Pat Van Eaton says that after the mill was closed in the 1920s, Charley planted trees, added some fish and installed diving boards. 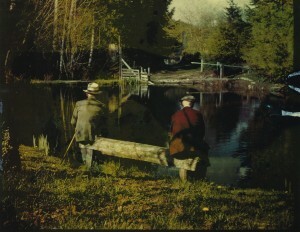 The next shot is of Charley sitting at his pond in later in his life. Images courtesy of Pat Van Eaton and the Boettcher family.